As part of our growing public speaking practice, Foskett Services is pleased to announce that Stephen Foskett will be delivering a technical presentation and the closing keynote at the DeltaWare Data Solutions Emerging Technology Summit on November 10, 2015. We are looking forward to a great audience of tech-savvy end-users at the Summit. Keynote: Out of the Lab and Into the Datacenter – Which Technologies Are Ready? Enterprise IT has long been a conservative field, with many promising technologies and products skipped in favor of a safer-seeming choice. But technology development continues at a rapid pace, and many IT professionals are seeing the need to transform IT or be left in the dust! In this keynote, datacenter expert Stephen Foskett will share his views on technology adoption: How to judge which products and technologies will sink and which will soar, and which trends are worth betting a career on. Breakout: The Four Horsemen of Storage System Performance Why do some data storage solutions perform better than others? What tradeoffs are made for economy and how do they affect the system as a whole? These questions can be puzzling, but there are core truths that are difficult to avoid. Mechanical disk drives can only move a certain amount of data. RAM caching can improve performance, but only until it runs out. I/O channels can be overwhelmed with data. And above all, a system must be smart to maximize the potential of these components. These are the four horsemen of storage system performance, and they cannot be denied. The DeltaWare Data Solutions Emerging Technology Summit will be held in Edina, Minnesota on November 10, 2015. Attendance is free for qualified end users. This keynote follows a very successful keynote at the Chicago VMware User Group UserCon in September. 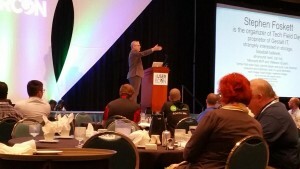 Foskett’s keynote at that event, “Gestalt IT – Why It’s Time to Stop Thinking In Terms of Silos”, was attended by over 500 IT professionals.